Alli Greening is one of our newest teammates. Here’s the story of how she moved to Seattle and connected with us. Also coming up on the blog: our best winter cycling tips, some triathlon race reports from the summer, and a look at our 2013 roster. Stay tuned! I’m one of the newer racers on Peterson Racing p/b Spokeswomen. I thought I could contribute to the blog by sharing the story of how I found the team and how glad I am to have found them! I moved to Seattle this summer for a new job, and well, really, because I couldn’t take another Tennessee summer–it was 106 degrees and soggy the day I left! I arrived to a beautiful mid-summer and early fall, raced a couple late-season races, and started attending the meet-the-team rides that were hosted by women’s teams and co-ed teams looking for women. I had a friend visiting for the weekend that Peterson Racing p/b Spokeswomen, and another team, were both hosting rides. My friend was a cyclist too, and so I emailed both teams saying I’d like to meet them but had a friend visiting, and asking if it would be ok to bring her. I never heard back from one team, but the Peterson Racing president replied back quickly, encouraging me to come with my friend and even offering to loan me an extra bike! 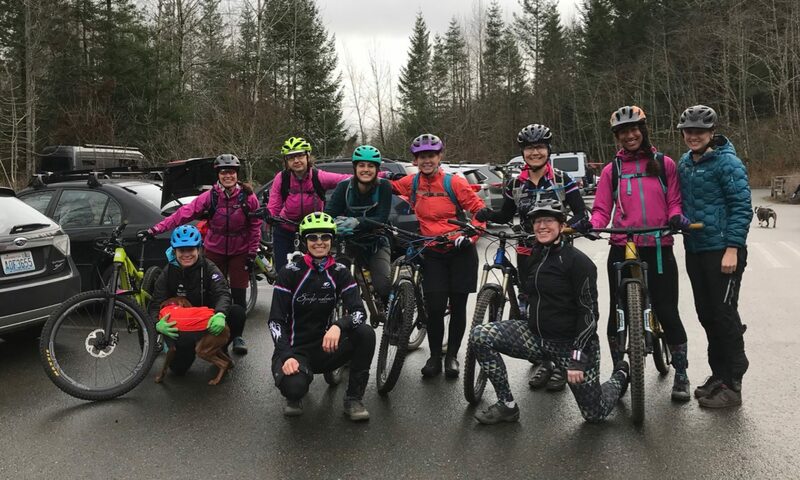 I was greeted by several warm, beautiful, and strong riders and we chatted for a couple hours about what the team had to offer, expected in return, and what I was looking for. I was excited by the family feel of the team, their desire to have fun and not take themselves too seriously, and their involvement with a very cool women’s charity, Jubilee. I think my house guest was even more excited! The incredible summer weather inevitably turned into what I’ve heard is typical for Seattle: 40-something and lightly raining. It’s due to continue, I’m told, into June. This leads to what the most important part of the team is: training buddies!! There is no way that I–a desert rat who started racing during the 15 years I lived in Albuquerque, NM–would get on a bike in the rain, much less race in the rain. In NM, if it rained we just delayed the race for 15 minutes until it was sunny again. Well, with my new team, I have had company for my winter biking misery every weekend I’ve been off work since the rain and cold weather started. The extra bonus is that I’ve had a Nordic skiing or snowboarding buddy for the other weekend day, too! I’m excited to get our kits for New Year’s and step up the winter training in hopes of finding a bit of fitness I can use to support one of Peterson Racing p/b Spokeswomen’s many strong riders in the 1/2/3 field this spring. Maybe along the way I’ll even do my first Nordic race with a teammate too! 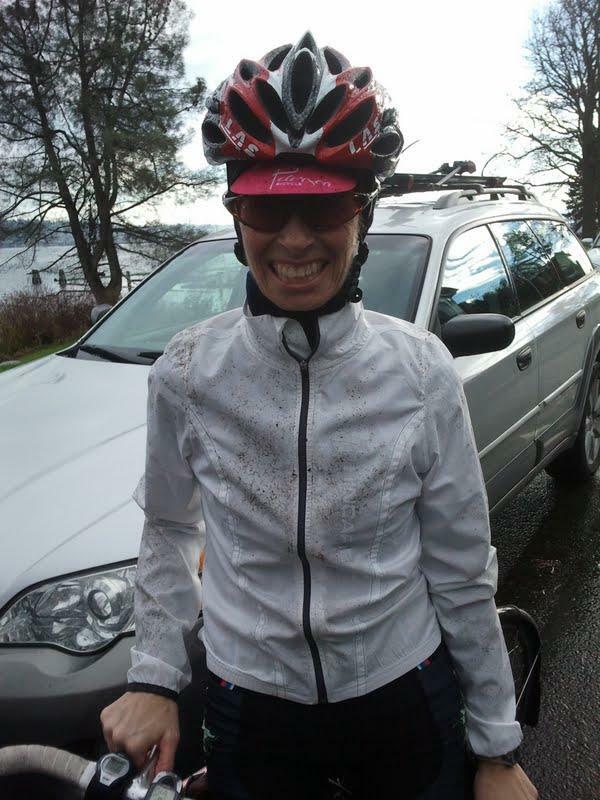 I don’t have many Seattle cycling pictures yet, but I got dirtier than I’ve ever been on a road bike last weekend and Tara snapped a picture at the end of the ride, so here it is!